This week's Vintage Love features Behind the Screen Door - an etsy shop featuring beautiful vintage goods for the kitchen, bar, and home. 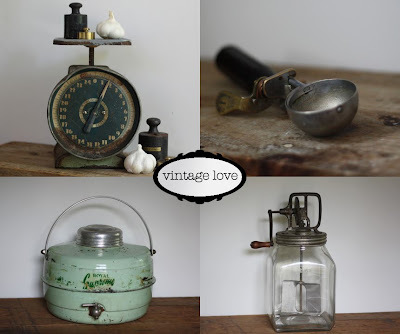 What do you love about vintage? I love the excitement of the hunt. You never know what you are going to come across. Think of modern day shopping and you are generally going to the store having in mind what you are going to buy and what store you are going to buy it from. Not so in vintage shopping - different regions and areas always turn up different and unique items. Through the items I find, I like to introduce people to vintage! What is the best item you have ever come across when you have been vintage/thrift shopping? I actually have in my shop right now a vintage working three beater GE mixer that I am absolutely in love with. I mean who would not want to bake a cake with this beauty? It is going to be bitter sweet when this item finds its real home. Thinking back, one find that still sticks in my mind was a Hamilton Beach commercial milk shake mixer that could do 3 shakes at one time. I mean pristine mint green, 3 unscratched chrome malt shakers, and in beautiful working condition. Of course I saw this from someone who knew what they had so it was out of my price range. I still am on the lookout for one of these. Anyone got one? Do you have a style or method you use when vintage/thrift shopping? Luckily my job allows me to travel which does lend itself to finding places and spots I would not normally travel to. Friday nights are spent on craigslist looking at the yard sale and estate sale listings mapping out my route to start early Saturday morning. So this Saturday when you get up and are enjoying your cup of coffee I have probably been out for several hours feet up in the air kicking with my face in the bottom of some big box of what someone else might call junk. Is there one tip you could share that might help someone who is new to thrifting and vintage shopping? Well, BehindTheScreenDoor concentrates on all things vintage for the kitchen, bar, and house. If there is one tip - no matter what type of vintage you are doing - do your homework and know what you are buying. Early on (and on occasion still) I will find the greatest thing in the world, get home and find out it is missing an accessory or there was one more colored bowl in the set which can really drag the price of the items down. I now carry my smart phone and kind of do research while standing there to make sure the item is complete and not a reproduction. If and when this happens no fear I also have a couple of miss matched sets down stairs while I continue to look for that missing bowl or accessory. Thank you Behind the Screen Door for participating in this week's Vintage Love. Photos courtesy of Behind the Screen Door.